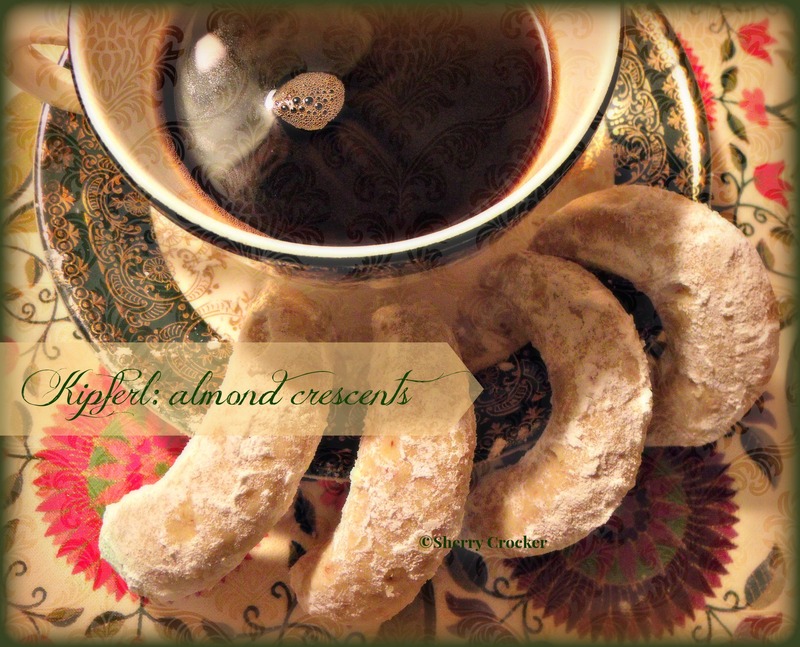 Kipferl hung on the edge of Gramma’s depression era saucer with fresh French pressed coffee. According to Wikipedia, the Kipferl is the ancestor of the French Croissant. I find that absolutely fascinating. I have always known it as an Austrian pastry. Somewhere along our line the Lauenstein branch lived either in Austria or somewhere very close to it… now, that doesn’t necessarily mean that was the first time the delicate pastry came to our family’s awareness. Also according to Wikipedia the cookie has been traced as far back as the 13th century and may be so far buried in antiquity that no one will ever know where they come from for certain. It is also credited as the origin of the French layered pastry that we know as the buttery, flakey, and melt in your mouth breakfast treat. I look at the cookie and I see the familiar crescent of the Ottoman flag. And of course I wonder why the cookie, which could have any shape imaginable, would take on the shape of a symbol for a people who represented, to the middle ages Europeans, a sad and desperate era of history. And Wikipedia has the answer…. to celebrate the 732 defeat of the Umayyads at Tours in France. Another legend says that it commemorates the defeat of the Ottomans in Vienna in 1683. However… if the Kipferl is so steeped in antiquity as to be untraceable then the most likely meaning for the shape is the representation of the moon which refers to the waxing phase and has some neo-pagan meaning which is lost us modern and less romantically inclined peoples. Where ever it is that these things come from, however the baker’s imagination derived this treat, the only thing that you have to know about these traditional cookies is that they are delicious. Often made a few days or a week prior to serving, these appear most often at Christmas time. Like most of my Grampa’s recipes, you only get it once a year, because there are seasons and we haven’t always had refrigeration. Now you can have your treats any time of year… if you are willing to pay the price for out of season fruits. I love these cookies. But they were not part of Grampa’s collection of traditions. We made it a tradition to by a box from the store each year. Then one year they tasted like sawdust and that was the end. It is still a very dry cookie and is most excellent with some egg nog or coffee. It is lighter than most of the cookies you are going to find on plates at home and office parties. The only problem is having a nut allergy. Suzani linen (pier1), Vintage hand-painted Ornaments (Germany, Poland) CDs: Bare Naked Ladies, Matthias Reim, traditional German Carols (from a friend). As a child I was always torn between the conflicting messages; and conflicting cultural directions. Life was pretty simple back then. Our parents kept it that way for as long as they could. That meant we thought we were pretty evenly split between the Welsh on dad’s side and German on mom’s. Split heritage. Split traditions. And for myself, that meant a decided split in musical preference: somber English traditional carols of introspection and the cacophonous clamoring of German bells in a full out riot of notes to go with the flurry of activity and high energy of celebratory joy. My favorites were the songs that told another part of the story than the one we heard in church: I Saw 3 Ships, The Holly & the Ivy, Good King Wenceslas, We 3 Kings, God Rest Ye Merry Gentleman & In the Bleak Midwinter. I suspect that this love for these tunes is what inevitably lead me to love Sting when he sang his way into my heart; a truth bore out by the release of his album If on A Winter’s Night. Our Catholic church, replete with sobriety in music, rather made one crave something joyfully frivolous. And while my ultimate favorite carol is the German Stille Nacht, too much introspection callouses the soul. The giddy glöckschen are a perfect foil to English sobriety. And maybe a little dance music. I have a huge collection of Christmas music, almost 30 CDs (huge for me). My Spotify list is quite extensive. But these are the top 3 CDs that I prefer to listen to. And you can see that the selection is mostly German. So many of our traditions come from the German culture and we do not even realize it. Christmas is the perfect time, in my mind, to embrace and extoll this place which holds such a fascination for me. You can see that of my three favorites, the German music is in the lead. There have been far too many years of bleak winters and solitary holidays observed since my father’s passing. Last year when Matthias Reim’s Die Große Weihnachts Party came out with its upbeat rhythms and clearly tinkling bells all of me got really happy, really quickly. Lasst uns froh und munter sein, oh du fröliche, Kling, glöckschen, klingelingeling and the original Wo bleibt der Schnee? Bare Naked for Christmas is a comfortable mix of tradition and current favorites. Most all of it is stripped down of the pomp, highlighting the songs themselves and the boys’ voices. The Hanukkah song and God Rest ye Merry Gentlemen being my faves. And then there is the non descript, plain looking little CD. 25 of the most beautiful songs I’ve ever heard song by a children’s choir will rip the Scrooge right out of you if he’s still lurking in faint shadows. The CD is from a vinyl record called Musik für Weihnachten, produced by the Bielfelder Kinderchor. About 13 years ago I met someone who shared my love of the German heritage, his Grandmother spoke only German in the house. He made this Cd for me, the best gift I’d gotten in a long time. Finally, feeling like I wasn’t a weirdo for caring about these things and missing the traditions that we were only just starting to understand when my grandfather passed, the fires for learning and exploring were rekindled.